So a lot of you have been asking me, why I moved to gaming for my streams and not to development, or why did I stop development. Well I didn’t stop, I’m just not streaming it, while I am getting used to streaming, I don’t need an added ‘cog in the machine’ i.e. issues with the stream (as some of you have seen, sometimes I don’t have audio, or a game crashes, etc) so until I’ve got my stream setup 99.99% perfect I will be sticking with games. So, I currently have all the graphics in play (and tfxing/ripping into as I need them), the level to reference and I’m just building the levels up. I’ve done it in a way so I can re-use most of the graphics, but then just change it’s colour as you pass into the level. 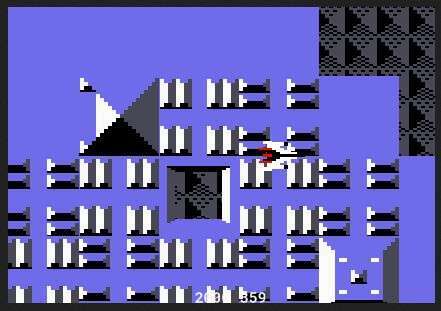 Once I have the levels all into it, I’ll then move onto the animations of certain aspects of the levels, being able to shoot the levels, being able to stop on the floor, enemies, boosting, warping, getting out the ship into the scientist hut, etc and more, obviously what was in the original game on the C64.